Why Bother with a Media Release? Call me a dinosaur! When I first started working in public relations, one of my first tasks was to write a media release. I would compose the draft release using an electric typewriter, and then a secretary would re-type it into a final format, photocopy it onto 100 sheets of business letterhead, and then stuff the releases into envelopes with a stamp for snail-mailing. The year Canada Post went on strike, my boss and I spent the day travelling through the city to hand deliver each and every release. Above is a sample of a two-page media release that was recently distributed! Feel free to use it as a guideline for your own book tour and/or reading. Please note there should be a margin around the edge of the media release. My scanner chopped it off. Oh…by the way….I have a new book out…and I’m going on tour….A media release gives the author some credibility, allows him/her to move forward in a more positive light. For the introverted, shy writer, the release places most of the bragging in the publisher’s hands. 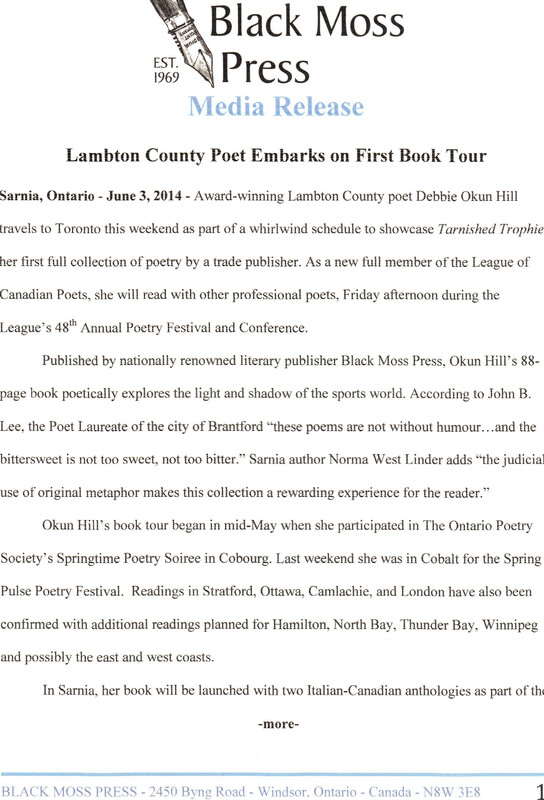 Sarnia, Ontario – June 3, 2014 – Award-winning Lambton County poet Debbie Okun Hill travels to Toronto this weekend as part of a whirlwind schedule to showcase Tarnished Trophies, her first full collection of poetry by a trade publisher. As a new full member of the League of Canadian Poets, she will read with other professional poets, Friday afternoon during the League’s 48th Annual Poetry Festival and Conference. 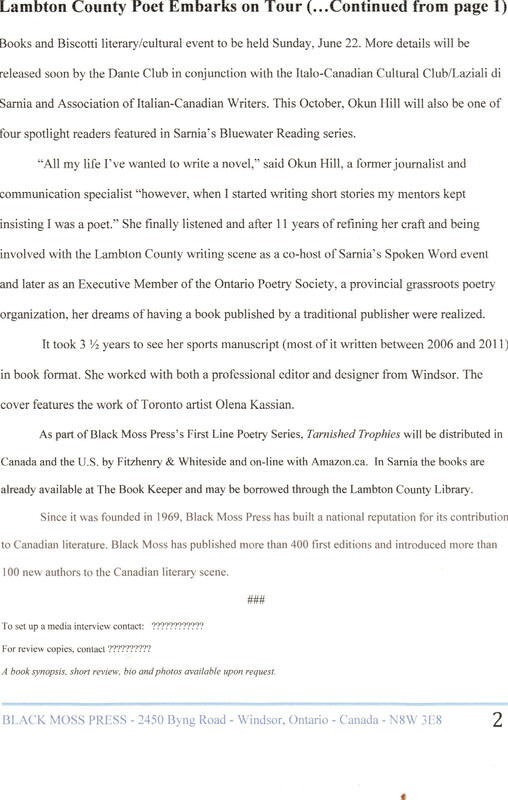 Okun Hill’s book tour began in mid-May when she participated in The Ontario Poetry Society’s Springtime Poetry Soiree in Cobourg. Last weekend she was in Cobalt for the Spring Pulse Poetry Festival. Readings in Stratford, Ottawa, Camlachie, and London have also been confirmed with additional readings planned for Hamilton, North Bay, Thunder Bay, Winnipeg and possibly the east and west coasts. Books and Biscotti literary/cultural event to be held Sunday, June 22. More details will be released soon by the Dante Club in conjunction with the Italo-Canadian Cultural Club/Laziali di Sarnia and Association of Italian-Canadian Writers. This October, Okun Hill will also be one of four spotlight readers featured in Sarnia’s Bluewater Reading series. “All my life I’ve wanted to write a novel,” said Okun Hill, a former journalist and communication specialist “however, when I started writing short stories my mentors kept insisting I was a poet.” She finally listened and after 11 years of refining her craft and being involved with the Lambton County writing scene as a co-host of Sarnia’s Spoken Word event and later as an Executive Member of the Ontario Poetry Society, a provincial grassroots poetry organization, her dreams of having a book published by a traditional publisher were realized. It took 3 ½ years to see her sports manuscript (most of it written between 2006 and 2011) in book format. She worked with both a professional editor and designer from Windsor. The cover features the work of Toronto artist Olena Kassian. 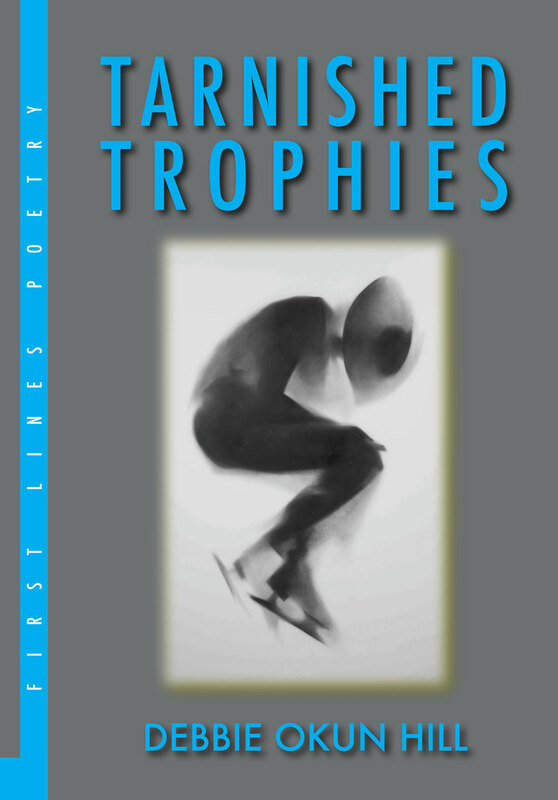 As part of Black Moss Press’s First Line Poetry Series, Tarnished Trophies will be distributed in Canada and the U.S. by Fitzhenry & Whiteside and on-line with Amazon.ca. In Sarnia the books are already available at The Book Keeper and may be borrowed through the Lambton County Library. A book synopsis, short review, bio and photos available upon request. This entry was posted in blog posts, News-Events, Promotional Tips and tagged Black Moss Press, Book Promotion, Book Tour, Debbie Okun Hill, Media Release, Poetry Events, Sports, Tarnished Trophies on June 5, 2014 by d78hill.